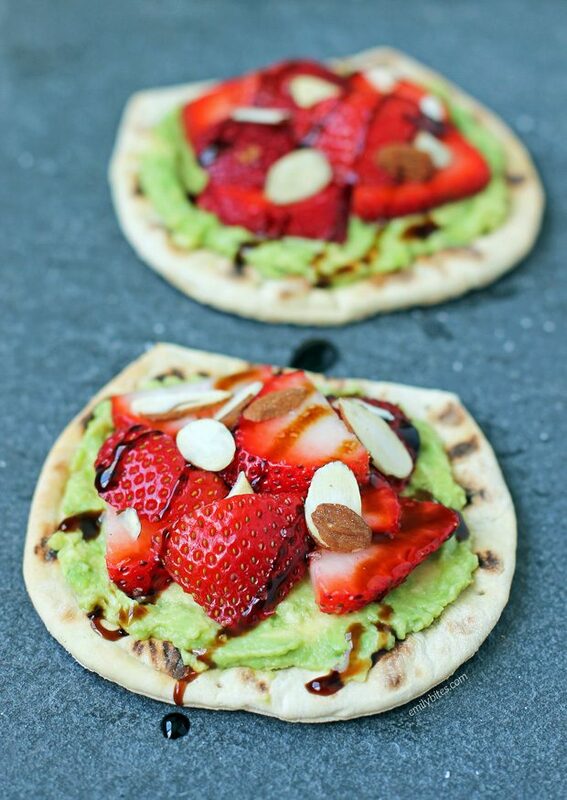 I have partnered with Flatout to create these Strawberry Avocado Toast Flats. I have been compensated for my time commitment to work with their product, however my opinions are entirely my own and I have not been paid to publish positive comments. These Strawberry Avocado Toast Flats are sweet, salty, tangy and they make a perfect breakfast or lunch! It starts with a toasted Flatout Foldit (what can’t they be used for?) topped with creamy, buttery mashed avocado, sweet strawberries, tangy balsamic glaze, crunchy sliced almonds and a sprinkling of sea salt. These flats are so easy and quick to make and I love how fun, fresh and filling they are. As many of you know, I can’t get enough of Flatout Foldits. They’re perfect for sandwiches, flatbreads, mini pizzas, desserts and tacos! 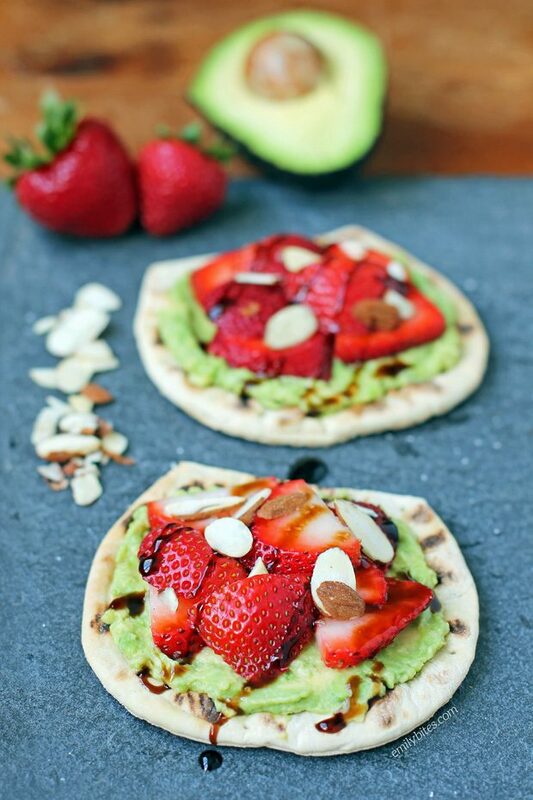 I loved using them to make these Strawberry Avocado Toast Flats because they add protein and fiber and they toast up perfectly. This entire recipe is just 211 calories or 5 Weight Watchers SmartPoints! I always have Flatout Flatbreads and Foldits in my pantry because there are almost limitless ways to use them – they’re so versatile! Flatout’s products are also endorsed by Weight Watchers which is always great when you’re counting points. Wondering what else to make with Flatout flatbreads? Check out my Buffalo Chicken Tacos, Easy Chicken Quesadillas, Barbecue Chicken Bacon Wraps, Taco Flatbreads, Greek Chicken Tacos, Easy Taco Cups, BLT Flatbreads, Apple Cheddar Turkey Wraps, Chicken Caesar Wraps, Veggie Lover’s Flatbread, Black and Blue Steak Wraps, Spicy Southwest Chicken Wraps, Peaches and Cream Dessert Flats, Three Cheese Mushroom Flatbreads, Maple Bacon Breakfast Wraps, Chicken Saltimbocca Sandwiches, Buffalo Chicken Pinwheel Wraps, Spinach Artichoke Flatbreads, Greek Snack Flats, Mexi Burgers with Guacamole, Chinese Chicken Wrap, Chicken Pesto Flatbreads and Bacon Cheeseburger Wraps! Slice your Foldit in half at the seam to make two rounds. Toast in your toaster oven to desired darkness. 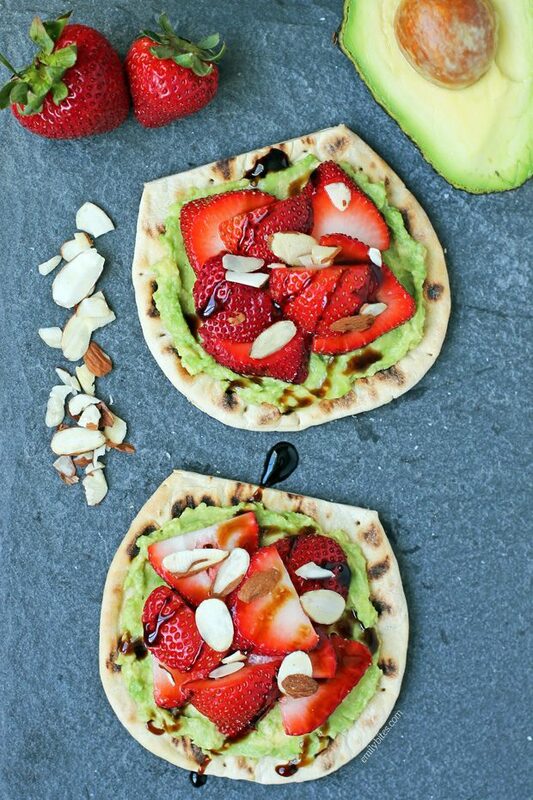 Spread each toasted round with half of the avocado and top with the sliced strawberries. Drizzle with the balsamic glaze and sprinkle with the almonds and sea salt. Every time I feel like I am in a rut, you post something amazing that I would’ve never thought of! Thanks for this one!! !